Our favorite dish using Kaeng Kua is Gaeng Tay Poe, a fantastic Thai recipe with citrusy flavor and sharp chile flavor. We recommend you try making Gaeng Tay Poe at home if youhave time time and interest. 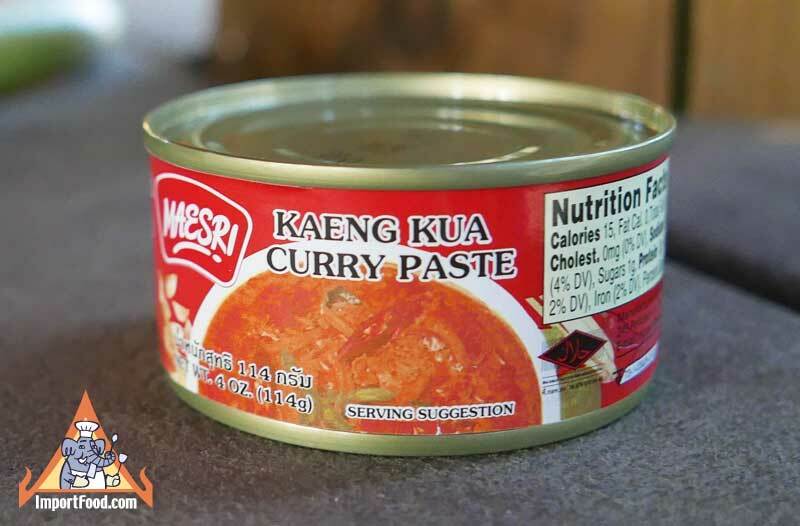 For a quick Thai dish using this product, stir fry one can of kaeng kua curry paste with 3 cups of coconut milk for about 5 minutes. Add 1.5 lb chicken pieces and vegetables of your choice and 2.5 cups water. Gently simmer until ready, sprinkle with fresh basil leaves and chile peppers, and serve with jasmine rice. Ingredients: chile 40%, garlic 25%, onion 20%, lemongrass 5%, spice 5%, galanga 3%, salt 2%. Product of Thailand. This delicious recipe is unique because it uses the whole kaffir lime fruit, which is uncommon in Thai curry. It's one of our family favorites. Gaeng Tay Po has wonderful crossover appeal for people who might come from a European-American background. The citrusy flavor, combined with the gentle and sharp flavor of kaeng kua, and the emphasis on using healthy crispy greens, all create a very satisfying meal. This should be a best seller at most Thai restaurants, perhaps it just hasn't yet caught on. Try to use the real morning glory (see photo and comment below, called Pak Boong in Thai). Tay Po refers to the fish that was used in the past for this recipe, pangasius lamaudii (black-ear catfish), but the fish has such a strong smell that nowadays people use belly pork.